Pictures, articles and books about BULLYING and KINDNESS (and tornadoes) appear below. Please feel free to comment on any of them! You may write about a time when you or a friend were bullied and how you solved the problem. You may also write about tornado activity, which is also a subject of the book, BUSTER THE BULLY. Post your comments on the “Contact us” page of this website. February is Black History Month! One of my favorite African American heroes is Frederick Douglass. He, like many African Americans, grew up as a slave. Born in Maryland, on or about Valentines Day, 1818, he was raised by his grandmother, who was a slave; young Frederick often was forced to help her on the plantation. At an early age, he was separated from his brothers and sisters and forced to work with the Ault family. The mistress allowed him to join her children’s reading classes until her husband forbade it. Frederick quickly realized the importance of reading and picked up scraps of newspapers and magazines wherever he could, even in the trash. He could sometimes convince the young Ault boys to help him with a word or two. When he was forced to leave that family, he was often beat up and bullied by his new master, Covey. Despite the hardships he endured at a young age, he went on to become an author, an orator and a spokesman for the rights of blacks and women. He truly changed history. Happy New Year to All! Hopefully, there will be less bullying in 2019! Tired of building a snowman and having bullies break it down over and over again, two sisters thought of an idea and carried it out successfully. After fifth-graders had attacked the snowman daily, the two girls froze an ice block and left it at the base of the snowman. When the bullies started kicking at the base, the ice block retaliated by given them sharp, non-permanent foot pains. The snowman was never attacked again! OCTOBER is BULLY PREVENTION MONTH! There are no dues and no sign-ups to become a member! Kids (or people of all ages) are welcome to join. All it takes is a smile & a promise to do or say Something kind to someone everyday! Spread kindness in every way! message from CafePress or ETSY! How to take action? an anti-bullying film festival, a student-led campaign guide and tips on how to stop bullying. Over the last year, schools throughout the US have experienced a frightening increase in bullying and acts of hate. Each year, schools across the US participate in bullying prevention activities during the month of October. This year, when hate is on the rise, our greatest challenge is to stop bullying and hate and move toward welcoming, identity safe, and inclusive places. The largest portion of hate incidents in the post-election period occured in K-12 schools and college campuses according to a report by the Southern Poverty Law Center. Incidents like these are being reported across the U.S.: swastikas on walls, African American students threatened with nooses, Heil Hitler salutes at sporting events, young people chanting “Build a Wall, you’re getting deported” as they point to Latino students. Immigrant, Black, Jewish, Muslim, and LGBTQ students continue to be targets of relentless harassment and bullying. We can make a difference in transforming school environments into safe and inviting communities for all students. 1. Check out the Anti-Bullying Film Festival and support an open discussion on ways to promote inclusion and stand up to hate. The school year opened with a tragedy at Shoemaker Elementary School. Counselors and teachers are helping students deal with this sad, unfortunatehappening, which his mother states was caused by bullying. Welcome back to School! The poster below appeared in the 50’s. The message is as clear today as it was then. America is made up of kids from different countries, different races, religions, etc. Stand up for them; don’t let them be bullied! School will be starting in another month across the country. Check out the website below for film previews and clips about “BULLY”, produced in 2014. Find out how Alex and 5 others stopped the bullying that happened to them in middle school. Parents, teachers, religious and organizational leaders will all help you combat bullying. It’s ok, it’s safe to tell a trusted adult! HAPPY APRIL FOOL’S DAY! There’s no fooling or kidding about bullying. 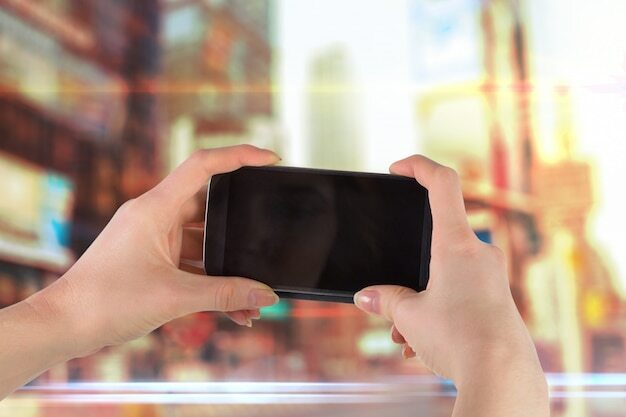 It continues to occur at alarming rates in the U.S. and around the world. Passover and Easter are two religious holidays this month that emphasize kindness and responsibilities to others. A Denver author and friend, Anne Nye West and I teamed up to present our books at the Colorado Book Festival at the Denver Public Library on Saturday, March 3, 2018. Over 100 Colorado authors were featured. 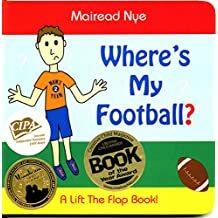 WHERE’S MY FOOTBALL is a lift-the-flap book for toddlers, written and illustrated by Mairead Nye when she was 12., and published by her grandmother, Ann Nye West. This fun, entertaining book tells the story of a little boy’s search for his lost football. Inspired by Mairead’s little brother, Johnny, the book is designed so children can lift the flaps, and as their parents read the story to them, follow along with Johnny as he searches his house for his football. The book is especially appropriate for encouraging little boys to read, and teaches valuable lessons of perseverance and self-reliance. WHERE’S MY FOOTBALL? 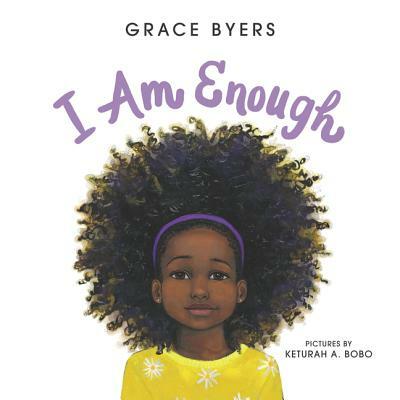 has earned three literary awards: Creative Child Magazine’s Best Board Book of the Year, the Moonbeam Children’s Book Awards bronze medal for Best Book by an Author Under the Age of 18, and an EVVY Award from the Colorado Independent Publishers Association. PARKER, Colo. (CBS4) – A Colorado teenager, Alec Ybarra, takes on bullying in the new film “Unmarked” with a unique take on the age-old problem at school by telling his own story as actor, writer, and director of the project he started at the age of 12 and will premiere in March almost two years after he came up with the concept. Go to: denver.cbslocal.com/2018/02/20/unmarked-colorado-film-bullying. The guide features the latest facts and statistics, expert tips, and national resources to help combat bullying in the autism community. 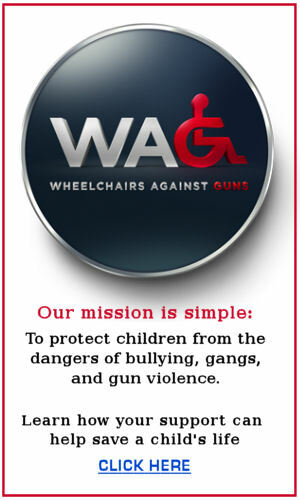 Unfortunately, those with special needs are particularly vulnerable to being bullied. The Guide includes facts and statistics, effects on bullying on children with autism, expert tips, and national resources. prizes, rewards and experiences for your 3rd – 6th grade students as they explore how to Choose Kind. The website, wonderkindclassroom.com, above includes a curriculum for 3rd-6th graders, contests, ideas, activities and more. Tips for more kindness in classrooms! November 27 is Cyber Monday, a day known for internet shopping deals. It’s also a day to take care that your credit cards are safe and secure. Take care that you are not bullied online. Check out www.prnewswire.com/news-releases/monica-lewinsky-bullying-prevention for advice, films and suggestions for bully prevention. You can use the emojis above when you correspond online. October is National Bully Prevention Month! Mid adult African American man is counselor or teacher in public elementary school. He is sitting in circle with diverse group of children and laughing while discussing issues. Children are learning about bullying. Unfortunately, bullying is still alive and well all over the globe. Father Makes Heartbreaking Plea After Special Needs Son Endures Horrific Bullying. My heart is in pieces right now…my soul feels like it’s ripping from my chest…this beautiful young man my son Jackson has to endure a constant barrage of derogatory comments and ignorance like I’ve never witnessed. He is called ugly and freak and monster on a daily basis by his peers at school. He talks about suicide…he’s not quite 8! He says he has no friends and everyone hates him. Kids throw rocks at him and push him shouting these horrific words…please please..
Go to: www.Goodhousekeeping.com for more articles about bully prevention. A new mentorship program uses fiction to teach children’s rights, and to help kids understand and prevent bullying. For some teachers, back-to-school excitement comes with jitters over how best to address new curriculum mandates. And for many parents, there are other worries, including concerns about their children’s social interactions and fears of playground bullying. As a researcher in children’s literature, I have developed a literary mentorship program that tackles both of these challenges. Read for Your Rights! uses children’s fiction to engage young children on the concepts of rights and responsibility, and with the content of the United Nations Convention on the Rights of the Child (UNCRC). The program also aims to reduce bullying at school. And preliminary data from a pilot at a Chilliwack elementary school in British Columbia during 2017 shows success. Participating teachers observed fewer instances of negative social behaviour after their students participated in Read for Your Rights! They also observed scenarios in which an altercation broke out and children made specific references to the program in attempts to elicit better treatment of one another. Can you imagine hearing the words: “Remember to ‘Choose Kind’!” or “We’re like the Bully Blockers!” ring out over the playground? That’s what happened in Chilliwack after the children participated in the program. In B.C., teachers are wondering how to meet new requirements to cover human rights within social studies lessons. Teachers are now expected to teach treaties such as the UNCRC beginning in Kindergarten. But how can such a complex legal document be made accessible for the youngest learners when even adults find it nebulous? your children have already experienced cyberbullying, but what is it exactly? ● It has to be done on purpose. ● It has to either happen several times or be a tremendous single event. ● The target must have been hurt in some way. 1. It can happen at any time of day or night, not just at school. 2. Harmful words and slander can spread literally across the globe. violence, cyberbullying can hurt a lot. ● Talk to parents as soon as anyone makes them feel uncomfortable. ● Don’t respond to any negative messages, as that’s often what bullies want. ● Never agree to meet someone they’ve met online. information from their victims, so these front-line defenses are crucial. apps. You also need to create the right environment at home. like anger a bully or agree to meet a “friend” for some fun. having in school or online. ● Practice how your kids should respond if they get a bullying text or email. ● Give them authentic praise so they are confident and secure in themselves. to create a relaxing, supportive environment at home. While you cannot always be there for your kids, you can help. The above article was submitted by Laura Pearson. She believes that every student has great potential and aims to help as many as possible unlock it. Ms. Pearson and Edutude strive to find unique, creative ways for parents and educators to encourage students to be challenged, motivated and excited by learning. Check out and read: https://www.drugrehab.com/guides/bullying/ a new educational guide about bullying and substance abuse. With tornado activity at an all-time high, it seems like Mother Nature is bullying our landscapes, buildings and people. Be careful, take precautions and STAY SAFE! 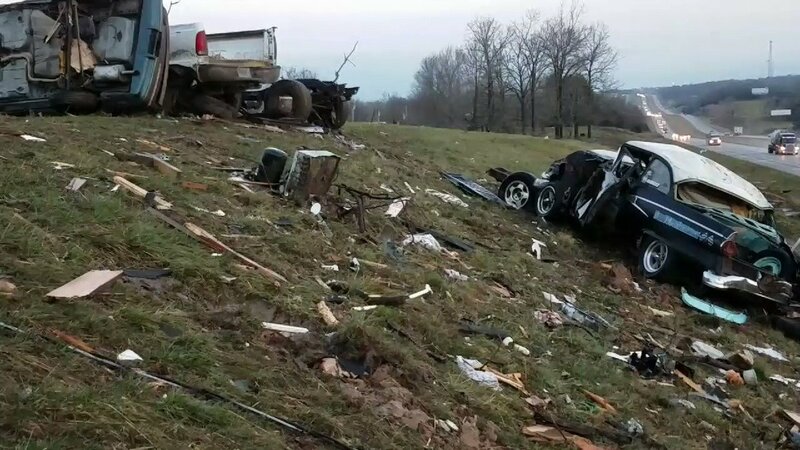 The most intense tornado to strike the U.S. as of mid-March was an EF4 that carved a 50-mile path through southeast Missouri and southern Illinois on Feb. 28, striking just north of Perryville, Missouri. Peak winds were estimated to be 180 mph, according to the damage survey from the National Weather Service in Paducah, Kentucky. Five homes were leveled in Perry County. The damage survey found evidence of multiple vortices as the tornado neared the Mississippi River. More homes were destroyed in Jackson and Franklin Counties in southern Illinois. Check out the weatherchannel.com for updates on tornadoes. “He didn’t understand why people would be so mean about something that could kill him,” recalled Cate. 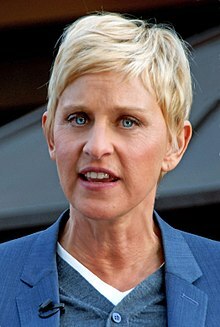 Her son M (name withheld), has severe peanut allergies, and like many, has experienced bullying related to his allergy. It is believed up to 77 percent of children report experiencing some level of bullying. Bullying is, “when someone is being hurt either by words or actions on purpose, usually more than once, feels bad because of it, and has a hard time stopping what is happening to them,” according to Pacers. 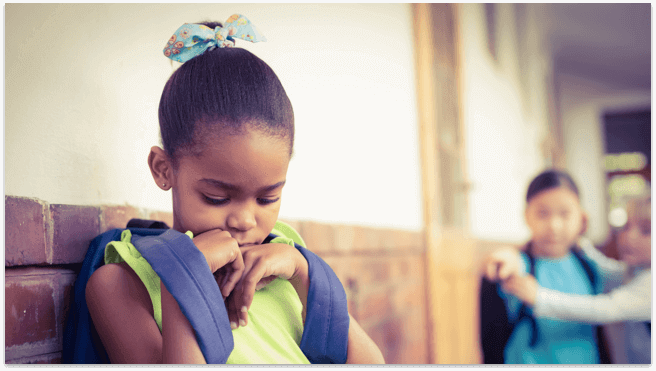 While it is difficult to conduct the longitudinal studies necessary to track bullying, it is known that nearly 24 percent of children experience some form of chronic harassment. In the long term, bullying can result in lowered academic performance, mental health issues and, in extreme situations, suicide. But while all children are vulnerable, there are certain populations at an increased risk. For example, children with disabilities are two to three times more likely to experience mistreatment. In an attempt to combat this problem, legal protection exists for disabled students who are experiencing mistreatment. But what about invisible disabilities, like food allergies (yes, it’s considered a disability)? 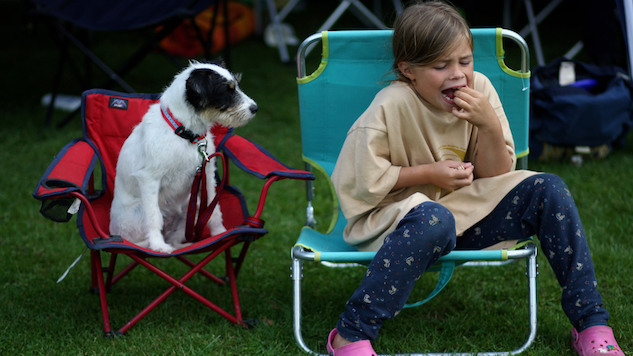 According to a 2013 study, more than one-third of children and teens with food allergies (ages 8-17) reported being bullied specifically for their food allergies—usually by classmates. All bullying is dangerous, but in many cases, like the one for Cate’s son, it can become a matter of life or death. For M, those numbers became reality when his food allergies made him the target of chronic bullying. 23% of secondary school students in the U.S. complain about being bullied, according to a federal study in 2015. For LGBT students, the percentage is 34%. Bullying is a public health issue which can lead to severe outcomes. “Because it happens, it doesn’t need to happen”, states Charol Shakeshaft, an education professor at Virginia Commonwealth University. At school, Bodi Irvine was bullied about his long hair which he’s growing to donate to a fund that helps kids with cancer. The video shows his conversation with his dad who has has wonderful advice for his son and for other parents who are concerned with the bullying of their children. Checkout: https://www.facebook.com/MicMedia/videos/1437167316306054/?pnref=story for the whole story. Haiku is a form of Japanese poetry which usually has 3 lines. Lines 1 and 3 have five syllables. Line 2 has seven syllables. Read the haiku below, then write a haiku poem about bullying. Help! I need a friend. Remember that Valentine’s Day is right around the corner, Tuesday, February 14th. Send a valentine to a family member or a friend. A homemade one will be especially appreciated. You might want to send one to someone who is feeling low, possibly friendless or extremely shy. Pictures, articles and books about Bullying appear below. Please feel free to comment on any of them! You may write about a time when you or a friend were bullied and how you solved the problem. Post your comments on the “Contact us” page of this website. Elizabeth Childs, DODDS educational administrator, shared the above picture and the following comment about a school in Germany. Kindness Week was a huge success at Vogelweh Elementary School! Our totally awesome PTSA bought T-Shirts for all students & staff members! The Kindness Assembly Program was wired, wild, & big fun for all grades K-5! Jan. 15, 2017 Happy, Peaceful Martin Luther King Day! 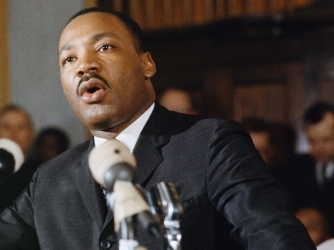 Martin Luther King, Jr. spoke about kindness. Two of my favorite quotes are below. You might want to write a quote about kindness and send it to the Contact Us page on this website. I’ll post it on this blog with your first name. Fox5 News in Atlanta, GA. posted an article about bullying. 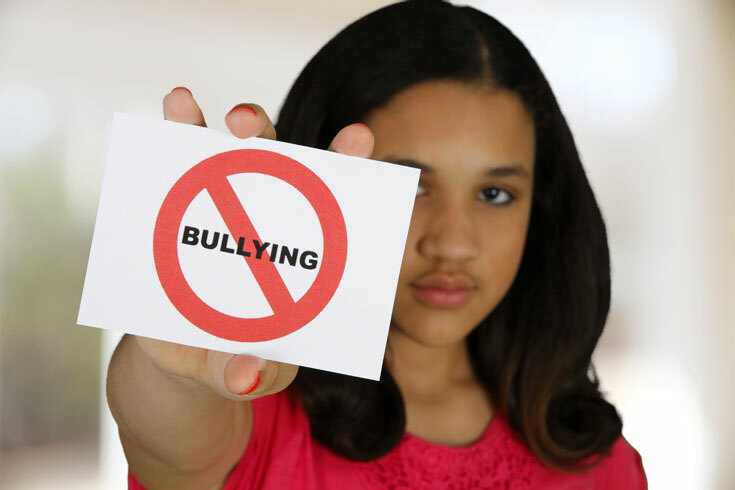 WebMD medical editor and pediatrician Dr. Hansa Barghava recently wrote a blog post about these type of bullying incidents, arguing they can be teachable moments for parents. “I think a lot more children are being bullied than we know,” Bhargava says. “We have reports of it being one in five.” And Dr. Bhargava says racial or ethnic bullying, like any kind of bullying, has three players: the bully, the victim, and the bystander, who witnesses what’s happening. Bhargava believes it’s important for parents to talk to kids on an age-appropriate level about what bullying is, why it’s wrong, and what they can do safely to stop it if they see another child victimized. Students in the DECA Club at Cherry Creek High School are working to prevent bullying in the schools with a campaign called “Peaceful Schools”. This year, in conjunction with the Rotary Club, high schoolers meet every 3 weeks with elementary students and use books, lesson plans and activities to help kids see the negative aspects of bullying. Happy Thanksgiving to all and to all a good meal! I hope your Thanksgiving includes kind deeds throughout the day! FLOTUS-elect (that’s First Lady of the United States) promises to make bully prevention one of her major goals. Trump is focusing on kids which is certainly a priority. She is co-founder of ConnectSafely.org, a nonprofit that promotes internet safety, including combating cyberbullying, Melania Trump is the parent of a 10-year-old boy. What is The Judgement Free GenerationTM? Planet Fitness is partnering with the Boys and Girls Club to eliminate bullying and promote kindness. The Judgement Free Generation is Planet Fitness’ philanthropic initiative designed to combat the judgement and bullying faced by today’s youth by creating a culture of kindness and encouragement. Bullying has become all-too-common in today’s society, with 1 in 4 youth reporting that they’ve been bullied and parents of school-aged children citing it as their #1 concern. With our Judgement Free Zone® and No Gymtimidation® policies as a solid foundation, Planet Fitness is the perfect company to tackle this issue. An outstanding short video of an ordinary boy who is confronted by three bullies! On October 21, 2016, I was the keynote speaker for the culmination of bully prevention at LOTUS School for Excellence. The students in grades 6, 7 and 8 were attentive listeners and very serious about preventing bullying at their school and in their lives.The student activities for Bullying Prevention Week are listed below. All K-12 Scholars were invited to join LSE in Bullying Prevention Week by dressing up according to the dates below and help make bullying a thing of the past! “Take a Whack Against Bullying” Wear Wacky and Tacky Clothes- Go all out! Nothing can match! “Make It Orange, Make It End” – Wear an orange shirt with jeans. 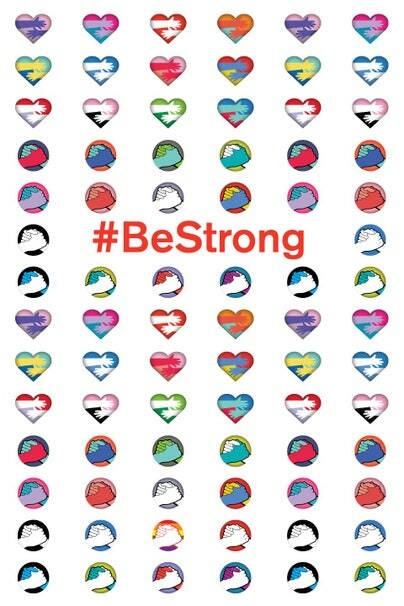 “Don’t Pair Up With Bullying” – Wear a sports uniform or support a favorite team. Visit: www.rhondastopbullying.org for information, podcasts, youtubes, and pictures about Rhonda’s Stop-bullying Foundation. Find out about the Arizona Tour, the leadership academy, her presentations and her advice column. Kids, teens, parents, teachers, organizations, religious leaders and victims of bullying will find useful ways to prevent bullying. Especially for parents and teens: An in-depth look at cyber bullying. It’s hard enough to deal with a bully in person, but what about when bullying happens online? 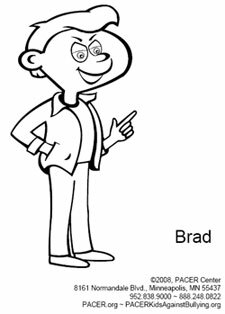 Go to: http://www.pacer.org/bullying/classroom/elementary/activities/ stick-puppet.asp for stick puppet plays which will actively engage children in anti-bullying activities. School has already started all over the world. If anyone bullies you or a friend or sibling, tell an adult; your parents, a teacher, counselor, or an adult relative or friend. YOU are not alone…there are many people, articles, books, resources and programs that can help prevent bullying. Many schools are enrolled in the Safe-2-Tell Program. Remember is a new, collaborative pop anthem that rallies against bullying while delivering a positive, hopeful message to stay true to who you are and to never let the negative feelings and comments affect your inner strength. The Remember anti-bullying anthem is powerful, uplifting, and inspirational, and we hope that it will reach the hearts and ears of youth everywhere! Cause happiness belongs to me. I will not be your fool. I won’t get lost in living. Who I am is who I want to be. I will remember how I want to get there, remember the person I am, the person I know. Where I take time to listen, with an open mind, to hear the beauty of my soul. And know that we are special in this life until the very end. My dreams unfold and clearly I can see. Thank you , Aubree and Lissy, for the website about tornadoes. I have added it to my list of resources. 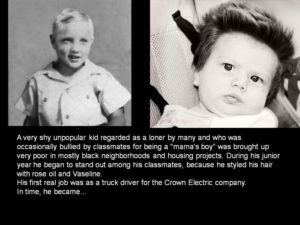 Elvis was a very shy, unpopular kid who was regarded as a loner by many of his peers. He was called a “mama’s boy” and was occasionally bullied by classmates. 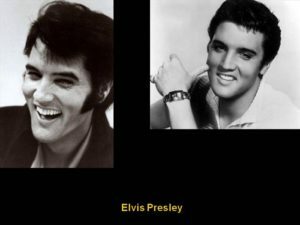 In his junior year, Elvis began to stand out from his classmates because he used rose oil and vaseline on his hair. RAISING RILEY, SAVING MYSELF: A Man and his Dog’s Struggle to Find Salvation is a new book by Zachary Anderegg. This extraordinary story combines the bullying of animals and the author himself in a true story of courage and bravery. A must for pre-teens through adults. Kids, do you see instances of bullying in books that you are reading? Usually, it’s October, Bully Prevention Month, when cartoons about bullying appear. This month’s comic strip by Matiuk caused a lot of response from Denver Post readers. What do you think is the meaning of the cartoon?